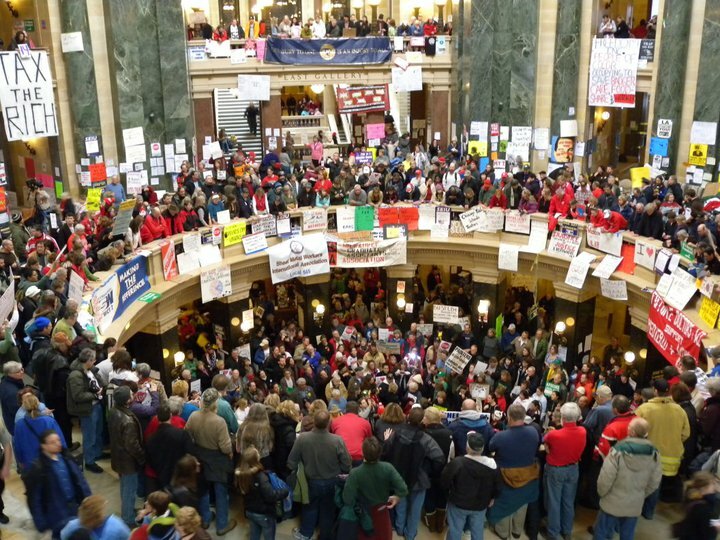 Ever since the fateful day in February 2011 when Scott Walker unveiled his “Budget Repair Bill” which dismantled 50 years of collective bargaining and drew hundreds of thousand of people to protest at the capitol, Wisconsin has been at war. From the infamous fake David Koch phone call, to the Summer of Recalls when a world-record nine recall elections were organized and implemented, historically speaking, 2011 was The Year That Was for our state. At first, the crowds at the capitol were consistently in the thousands, if not tens of thousands. 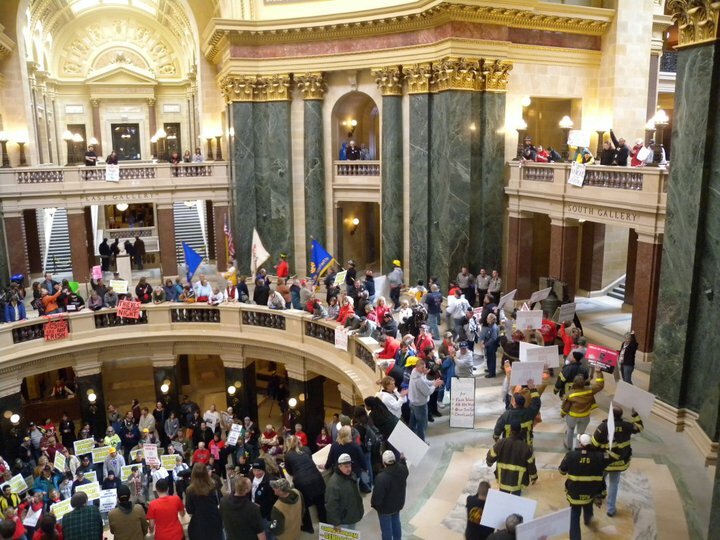 At their peak, hundreds of thousands of people moved through and around the capitol petitioning for a governmental redress of grievances for how the new governor had hijacked Wisconsin. Somewhere between the Democrats’ trip to Illinois in February and the Supreme Court election in April, the protests died down. As the weeks wore on, people turned their focus away from protesting, and onto the recalls and into the courtroom of Judge Sumi, who was hearing the trial of Scott Fitzgerald and his blatant violation of Wisconsin’s open meeting law. The day after the Budget Repair Bill was illegally rammed through the legislature, a group of protesters decided to meet regularly over lunch in the capitol rotunda to sing together for an hour. On March 11, 2011, the Solidarity Sing Along was born. Created as a way to keep the voice of the movement alive, the Wisconsin Network for Peace and Justice supported the start-up by printing songbooks for daily participants. Included among the well-respected songs of protest like “Joe Hill” were all kind of tunes re-written to fit the Wisconsin Movement. “Roll Out The Recalls” also allowed for dancing, as protesters paired up to polka around the rotunda floor. And the rest, they say, is history. 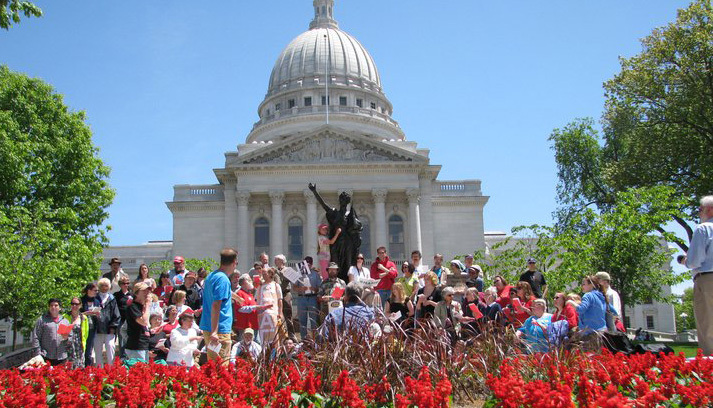 On March 17, 2012, SSA received the ACLU of Wisconsin William Gorham Rice Civil Libertarian of the Year Award for being the longest-running singing protest in history. They continue to serve to maintain a daily progressive, pro-people presence at the Capitol, as well as provide a place where citizens can come together and rejuvenate their spirits through song. The tradition of protesting through song goes back to the earliest days of our nation’s history. During the 20th century, protest songs became an important way for people to express their feelings about civil liberties, about civil rights, workers’ rights, women’s rights, gay rights, economic and social justice, politics and war. Over the last decade, these songs have become an important part of American culture. From their well-known recording artists and singers, to the ordinary people coming together to sing, their voices in melodious activism have succeeded in bringing out change in our nation. The Solidarity Singers each day keep this tradition alive. Join the Solidarity Sing Along on their first road trip Saturday, March 31 to Stage North in Washburn, Wisconsin to celebrate the solidarity that arose between the north and the south in the stand against the ferrous mining bill. Meet the activists who worked on the front lines, find out how we can all continue to stand strong together for the Penokee Hills, and raise your voice in song.